PRNewsfoto/Norman’s Rare GuitarsA collection of guitars, stage-worn apparel and other items that once belonged to Tom Petty will go up for bid as part of an entertainment memorabilia auction that will be held Saturday, July 21, in Dallas. The guitar and hat are expected to fetch $300,000. The Petty collection is being sold by Norman Harris, owner of the Norman’s Rare Guitars shop in Tarzana, California, in partnership with Heritage Auctions. 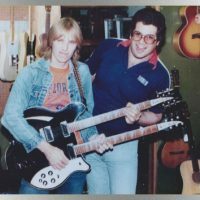 Petty originally purchased the 1965 Gibson SG decades ago from Harris, who then reacquired the guitar in a trade with Tom. In return, Harris gave Petty a rare Rose Morris Rickenbacker guitar, while Tom included a variety of stage-worn clothing items with the SG. Other items Harris is selling include a Petty-owned and signed 1963 White Gibson SG Junior electric guitar, and an eclectic variety of jackets that Tom wore onstage during various tours. Visit HA.com for more details. Harris intends to donate part of the proceeds raised by the items to Petty’s favorite Los Angeles charities: the Midnight Mission, which aids local homeless people; and the Tazzy Animal Rescue Fund. In other Petty news, a mysterious countdown clock that’s scheduled to tick off today at 10 a.m. ET has been posted on his official website. Reports suggest that a new Petty box set will be announced.